On TV you'll often see infomercials for oddball products you never knew existed or knew you even wanted. 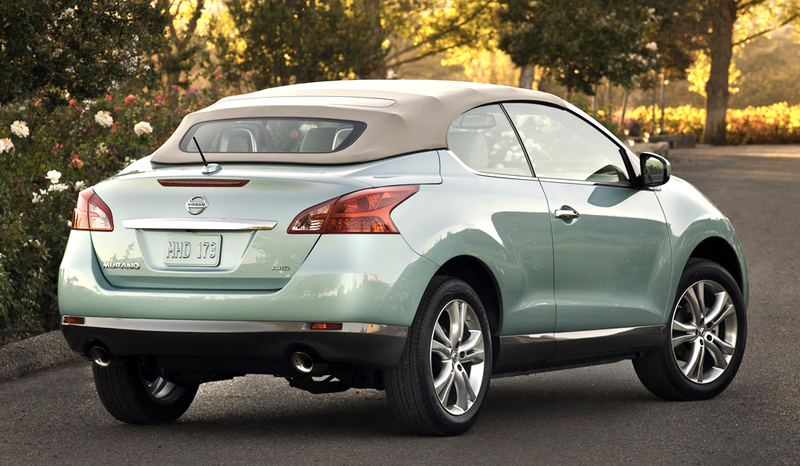 The 2014 Nissan Murano CrossCabriolet would likely qualify as just such a thing. In fact, it's easy to come up with the ad dialogue: "Look at this, Dan. It's an SUV and a convertible!" Unquestionably, the Murano CrossCabriolet is an unexpected pairing of attributes, but for a niche audience of consumers, it could hold some appeal. Since it's related to the automaker's popular midsize Murano crossover SUV, the Nissan Murano CrossCabriolet has that SUV's increased ride height plus all-wheel drive as standard. With these attributes in place, this is one convertible that can be driven year-round, even in northern latitudes where other ragtops spend the winter hibernating. Nissan made a few modifications to support its transition to al fresco motoring on the CrossCabriolet. In addition to the obvious ones such as the loss of two doors, the addition of a power-folding soft top and a two-person, rather than a three-person, rear seat, the Murano CrossCabriolet has a number of hidden chassis reinforcements to compensate for the rigidity lost when Nissan lopped off the metal roof. Like the regular Murano, the CrossCabriolet has an upscale cabin done up in rich-looking materials, including supple leather upholstery and handsome wood trim. It also comes standard with a nice collection of standard features, including xenon headlights, leather upholstery, keyless ignition and dual-zone automatic climate control. Counterbalancing these strengths are a few weaknesses. Opening the CrossCabriolet's two long doors can be an issue in tight parking spaces. And compared with most other convertibles, not to mention the regular Murano SUV, the CrossCabriolet feels rather ungainly: It's a comfortable cruiser, but it's not the least bit sporty. Also, the CrossCab's sticker price is still relatively steep, even though Nissan has lowered the MSRP by a few grand this year. In this price range, there are other convertibles to consider (the Audi A5 and Chrysler 200 come to mind) and plenty of other SUVs. There's also the Jeep Wrangler, which is also a convertible SUV but vastly different in its mission and appeal. In the end, there's really nothing quite like the 2014 Nissan Murano CrossCabriolet, though you'll need a pretty specific set of tastes to appreciate this convertible-crossover-SUV mash-up. 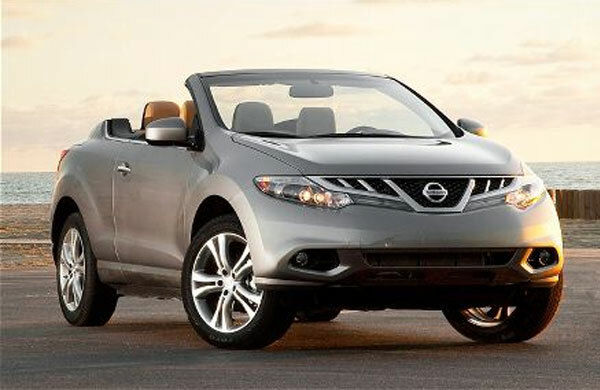 The 2014 Nissan Murano CrossCabriolet is a midsize crossover convertible with seating for four passengers. It's offered in a single very well-equipped trim level with a list of standard features including 20-inch alloy wheels; xenon headlights; foglights; heated outside mirrors; a power-operated folding soft top; dual-zone automatic climate control; leather upholstery; a power driver seat with memory settings; heated front seats; keyless ignition/entry; cruise control; an auto-dimming rearview mirror; Bluetooth phone connectivity; a rearview camera; and a seven-speaker Bose audio system with CD player, satellite radio and USB/iPod interface. The options list is short; it includes upgraded leather upholstery and a Navigation package that offers a voice-operated navigation system with real-time traffic and Bluetooth streaming audio. The Murano CrossCabriolet is powered by a 3.5-liter V6 that puts out 265 horsepower and 248 pound-feet of torque, both of which are up a tick from the version in the regular Murano. The engine comes paired to a continuously variable automatic transmission (CVT) and standard all-wheel drive. In Edmunds performance testing, the CrossCabriolet went from zero to 60 mph in 8.2 seconds -- just 0.3 second slower than the regular Murano. EPA-estimated fuel economy is 17 mpg city/22 highway and 19 mpg combined. Unlike the regular Murano, which takes regular gas, the CrossCabriolet prefers premium fuel. The 2014 Nissan Murano CrossCabriolet comes standard with antilock disc brakes, traction and stability control, front seat side-impact airbags, door-mounted side curtain airbags and active front head restraints. Rollbars behind the rear seats that automatically deploy in the event of a rollover accident are also standard. In Edmunds brake testing, the CrossCabriolet came to a stop from 60 mph in 124 feet, an average distance for an SUV-sized vehicle. The Murano CrossCabriolet's passenger cabin is surprisingly roomy by convertible standards. Front seats are comfortable and supportive, with a good amount of headroom and legroom. Even the two rear seats are fine for adults. Getting back there is pretty easy (as long as the windows are lowered), though the doors are absolutely enormous, which makes tight parking lots a bit tricky. The doors also open and close with a tinny, hollow thwack -- a consequence of the CrossCabriolet's lack of a fixed roof. Build quality and materials are on par with many entry-level luxury cars, and the Murano CrossCab's long list of standard features only adds to the high-end feel. We also like the navigation system's easy-to-use touchscreen interface. The power-operated soft top takes a while to open or close, but it does a good job of keeping wind and road noise at bay. The CrossCabriolet trades away a good bit of its practicality for the joys of al fresco motoring. With the top up, the trunk offers a passable 12.3 cubic feet of cargo space. That's not bad for a convertible, but it's considerably less capacity than a typical midsize crossover SUV offers. 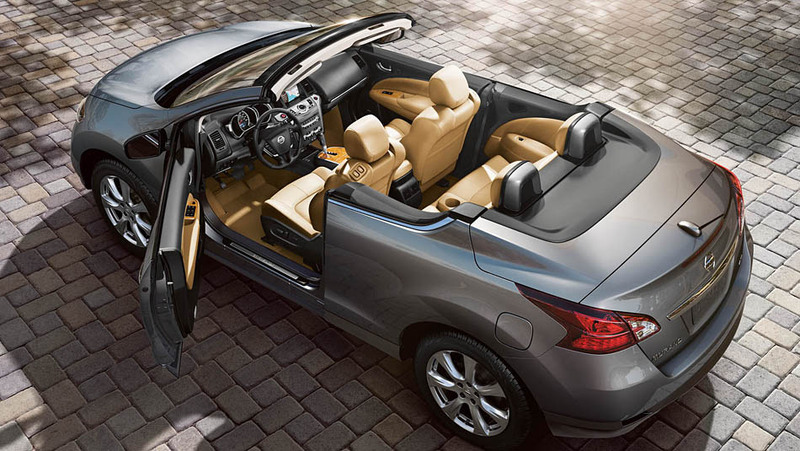 The 3.5-liter V6 engine in the 2014 Nissan Murano CrossCabriolet provides both energetic performance and a refined feel. The transmission does a good job of keeping the powerful V6 in its sweet spot while sparing the CrossCabriolet's occupants from the droning noises often associated with CVT-equipped vehicles. Top-down driving in the Murano CrossCabriolet is relatively hairdo-friendly, as there's surprisingly little wind buffeting for front passengers. Nissan's drop-top crossover SUV rides comfortably, too. Handling is less impressive, as the CrossCab's combination of increased weight and reduced structural rigidity makes it less athletic around turns than the regular Murano, as well as most other convertibles. You'll also notice occasional vibration through the steering wheel and the windshield header/frame, as there was only so much the automaker's engineers could do to stiffen the Murano's body after removing its fixed roof. If you're simply looking for a roomy convertible for leisurely boulevard cruising, though, the 2014 Nissan Murano CrossCabriolet should fill the bill just fine.